We, of course, would attribute this tree behaviour to genetics. But couldn’t we say the same about the character of any human being? Children clearly have innate personalities, pre-packaged in their genetic structure. They grow up expressing these qualities. Why would we expect a tree to be any different? We accept that dogs, ant and robins all live in a different reality than we do. But the more we know about them, the better we can imagine what their lives must be like. Unlike a hummingbird, we don’t have wings to flap many times per second or the minds to routinely remember 500 flowers in succession, so we let them be themselves and appreciate the marvel of their existence. Now we have scientists opening our doors of perception about trees. Consider this a necessary part of the growing awareness if we are to function mindfully and wisely on this most amazing of all planets. 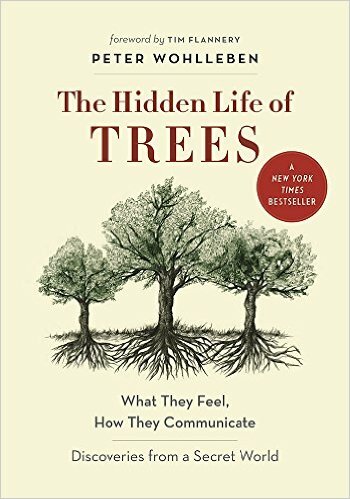 To continue opening the doors of your perception, check out Wohlben’s book, The Hidden Life of Trees. If our sense of forests and trees changes because of this new awareness, it is for our betterment and, ultimately, for the betterment of the place in the universe where we must learn to live. So, the sense of peace, order, design and collective intelligence we get when being in a mature forest is now supported by scientific evidence. Indeed, the feeling of cooperation, harmony and tranquillity exuded by such forests derives from multitudes of species all living together in a community of sharing, nurturing and communicating. The complexity and sophistication is comparable to a human culture or civilization.